If you need a dentist in Polk County Florida, Kimberly Boyett DDS is a terrific choice. Our goal is to provide the highest quality dental care while enhancing the lives and smiles of our patients. Located in Winter Haven, Florida, we offer a peaceful and relaxing atmosphere, along with thoughtful dental care. We offer general dentistry, cosmetic dentistry, bridges, crowns, fillings, dental hygiene, implants, teeth whitening, teeth cleaning, periodontics, and more. Dental sealant is a thin, plastic coating painted on the chewing surfaces of teeth. Usually applied to the back teeth (the premolars and molars) -- to prevent tooth decay. The sealant quickly bonds into the depressions and grooves of the teeth, forming a protective shield over the enamel of each tooth. 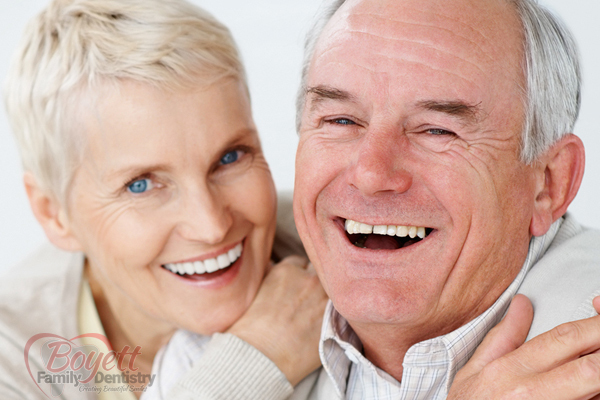 Dental implants are the next best thing to having your own teeth. Dental implants are devices placed in your jawbone that are substitutes for the root portion of lost natural teeth. The implants provide a stable foundation, which allows you to bite, chew, and smile with the same confidence you had with your natural teeth. Having a dental emergency? We offer same day appointments. Please contact our office. Broken teeth or just excruciating pain? Give us a call - we have same day emergency services. Everyone loves a bright, white smile. Today there are a variety of products and procedures available to help you improve the color of your teeth. Professional whitening products contain carbamide peroxide or hydrogen peroxide that helps lighten the color deep in the tooth. Dental hygiene is the practice of keeping the mouth and teeth clean. Daily preventive care such as brushing and flossing will greatly enhance the overall health of teeth, along with regularly seeing your dentist or oral hygienist.